A team of scientists from Radboud University in Nijmegen has recorded the first laboratory infrared spectra of negatively charged gaseous polyaromatics. These molecules, which are hypothesized to occur abundantly in interstellar clouds, had until now only been studied as neutrals and positive ions. This research is possibly good news for radio astronomers as well. They will have a better idea of what they need to look for. Thirty years ago, few people would have believed that complex molecules would occur in interstellar space. Nowadays astronomers assume that polyaromatic hydrocarbons occur abundantly. The assumption is based mainly on a set of emission bands observed in the infrared spectra of numerous interstellar objects. The frequencies of these bands are characteristic for polyaromatic molecules, as spectra recorded in the laboratory have shown. Up until now virtually all of the laboratory data address the spectra of polyaromatics as neutrals and positively charged ions. 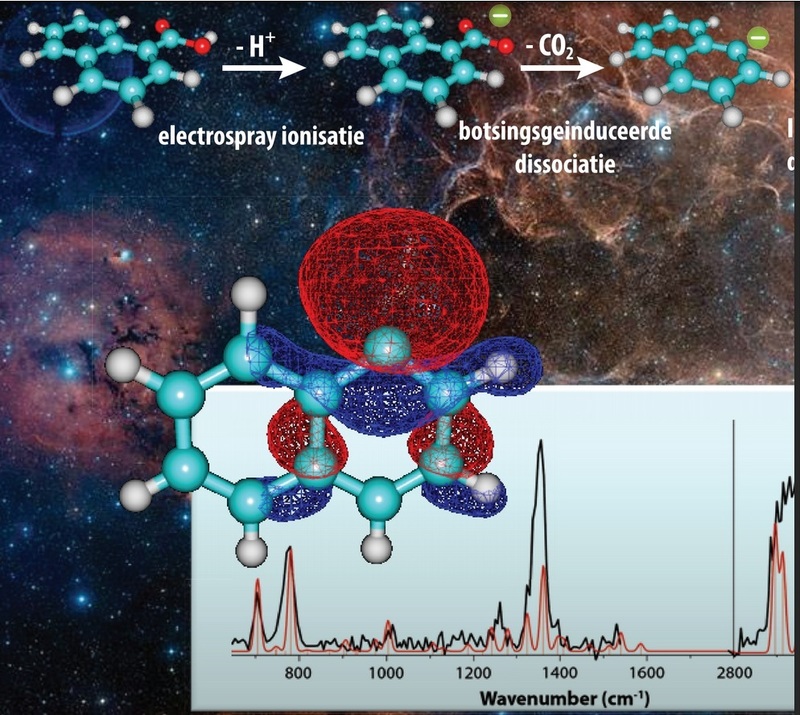 The Nijmegen scientists recorded the first infrared spectra for negatively charged polyaromatic hydrocarbons. The negative ions are in fact deprotonated polyaromatics and were produced in the mass spectrometer by making use of ion chemistry. For the measurement of the infrared spectra of the negatively charged hydrocarbons the researchers used a mass spectrometer coupled to the free electron laser FELIX. They compared their observations with quantum-chemical calculations, providing important experimental verification for such computations on these negatively charged systems. Furthermore, the calculations revealed that these deprotonated polyaromatic hydrocarbons have an unusually high electric dipole moment. This possibly allows radio astronomers to detect these species via their pure rotational spectra, although this will be far from easy. The small rotational constants, the high abundance of 13C isotopomers, and the large partition function may seriously impede such efforts. In the graph the experimentally observed infrared spectrum of the gaseous naphtyl anion (deprotonated naphtalene) is compared with a spectrum calculated using quantum chemistry. A schematic representation of the experimental procedure that was used to record the spectra is shown above the spectrum.